Zamil Offshore – one of the leading offshore support and marine integrated service providers for the oil and gas industry in the Middle East – is currently undergoing comprehensive restructuring aimed at spinning off of its three divisions to three affiliated companies. 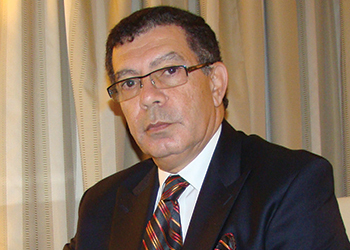 The aim, says Hassan Abouraya, consultant engineer, CBD/I marketing/ risk management executive – Zamil Offshore, is to allow each division to grow more either organically or via joint ventures, acquisitions and mergers. Zamil Offshore – founded by Zamil Group in 1977 with the prime objective of providing offshore support vessels (OSVs) to Saudi Arabia’s national oil company Saudi Aramco – has been active in the marine offshore support business for almost four decades. During this period, it has substantially expanded its offshore fleet by acquiring more new vessels and diversifying into other marine business areas. Today, it is considered one of the largest companies in the Middle East while eyeing further growth and diversification, regionally and internationally. More importantly, it has adapted well to the fast pace of change that characterises the offshore oil and gas industry. Zamil Offshore currently is made up of three divisions: the Marine operations division – spanning vessel ownership and operation; Shipbuilding, Ship and rig repair and Sea ports operation division and the Offshore/onshore engineering and construction services. Zamil Marine continues adding vessels: Zamil’s Marine Operations, currently, owns, operates and manages 76 vessels. It is the largest and youngest specialised offshore support fleet with average age of 7.1 years. Its utilisation rate of 97.5 per cent is the highest compared to other fleets operating worldwide. Zamil’s fleet is very diversified and includes: diesel electric and Rolls Royce UT anchor handling tug/ supply/ safety vessels, supply vessels, multi-purpose vessels, maintenance/work boats, crew boats, diving support vessels and a self-propelled jack-up lift-barge. The company’s fleet continues to grow. The recent additions include two dive support shallow draft vessels Zamil 601 and Zamil 602 built at their own new Dammam shipyard and two multi-purpose fast crew boats Zamil 105 and Zamil 106 from Hong Kong. The 36 m crew boats have a deck space of 94 sq m, and 70 passengers seating capacity and designed to carry 50 tonnes of cargo. Most of Zamil’s fleet vessels are under long term charter contracts to Saudi Aramco. During 2015-2016, the company plans to diversify its operation within the Arabian Gulf in the first phase then to South East Asia, east, west and north of Africa, informs Abouraya. Zamil Shipyards assumes leading position: According to Abouraya, the first division set for spinoff is Zamil Shipbuilding and will be announced officially at the end of 2015. In parallel to the preparations for the spinoff, Zamil Shipyards has started working to increase its competitiveness, aiming at realising an in kingdom cluster of marine services network in order to be able to serve their clients better and build long lasting relationships. Since it ventured in shipbuilding in 2002, Zamil Offshore is the only shipbuilder in Saudi Arabia offering a full range of services in maintenance, repair, refit and conversion of all types of offshore and harbour service vessels. It continues its capital commitments in expanding its shipbuilding and repair activities on both Saudi coasts. In the Gulf, Zamil’s entirely new shipyard – built on 228,000 sq mtr of reclaimed land – was officially commissioned in April. 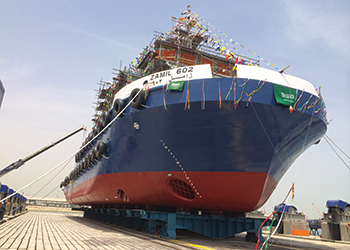 By the addition of this yard, Zamil Shipbuilding now manages and operates three shipyards: two in Dammam for shipbuilding and ship repair and one in Jeddah for ship repair. Generally, Zamil Shipyards focuses on building offshore and harbour service vessels. So far, more than 50 diversified offshore vessels, harbour tugs, port service units, navy tugs and coast guard surveillance vessels have been already built and delivered; 26 of them were for offshore support and joined Zamil fleet under long term charter contracts to Saudi Aramco. "Zamil Shipyards are now among the market leaders on the Arabian Gulf and the Red Sea, specialised in ship repair and the construction of custom-made offshore and harbour service vessels," says Abouraya. In response to competition in the area, the company started implementing diversification strategy – it has started building vessels for the defense and security for local and regional customers. It has already built and delivered 3 tugs for the Saudi Royal Navy and currently is building four surveillance / logistics vessels for export to the Kuwaiti Coast Guard. Last week, Al Zour 10 first of the Quartet under construction for the Kuwaiti Coast Guard was launched at Zamil New Dammam Shipard. At the same time, Zamil Offshore is considering building two shallow -draft anchor handlers of 60-tonne bollard pull at its new shipyard in Dammam although no final decision had been made on this at press-time. Zamil Offshore manages and operates three shipyards out of the four available in the kingdom. The two Dammam shipyards are located on the Arabian Gulf – East of Saudi Arabia and the Jeddah shipyard is located in the West on the Red sea. The Dammam shipbuilding and ship repair shipyards together offer: two ship lifts 1,500 and 7,300 tonnes lifting capacity, 18 dry berths for vessels up to 102 m in length and 32 m in breadth, 1,300 m of repair/ outfitting quays with water depths between 6 and 12 m.
While the Jeddah ship repair yard facilities include; two floating docks 11,000 and 19,000 tonnes lifting capacity and two piers. The total 3 shipyards are operated by highly skilled 1,500 employees. Zamil Engineering and Construction Services: The other division currently undergoing restructuring is Zamil Engineering and Construction Services. In 2003, Zamil Offshore won Saudi Aramco’s seven years hook-up business contract and ventured in the engineering and construction services. The contract involved all phases of support for offshore platforms; up-grade, modification and commissioning of offshore wellheads and other related construction activities, boats, equipment and personnel. Since then the division’s business has grown. Now, it manages and operates a fleet of 11 workboats, four supply vessels, 6 crew boats and with the addition of its new self-propelled jack-up lift boat, it is now renowned as "fully integrated engineering and construction services company". In 2011, this division succeeded in renewing its long term contract with Saudi Aramco and increased its scope of services to include: all offshore oil and gas hook-up services; maintenance of offshore marine structures, facilities and piers, modification of observation wells platforms and hydrogen-sulphide mitigation services.